Thanksgiving may be the best time to enjoy great wine. But it also provides a perfect occasion to stop for a moment and consider those whose labors produce the wines we drink. This September, just a few days before a series of devastating fires ripped through the Napa and Sonoma wine regions, I rose in the darkness to join a harvest crew at Ehlers Estate in St. Helena, Calif., for a predawn picking of the estate’s cabernet sauvignon grapes. It was a revelation. During harvest season, Napa Valley glows in the dark. At 4 a.m., Highway 29 is alive as large lorries filled with grapes, carloads of farm workers, and food trucks bearing breakfast burritos travel up and down the valley. And in the vineyards, Klieg lights illuminate the vines for the pickers, making them shine like film sets. Each day, tons of grapes are snipped in the chill of the early morning and sent to the wineries to begin their magical transformation into wine. The morning that I joined Francisco Vega, the vineyard manager and Cellar Master at Ehlers, and his eight-man crew, temperatures were in the low 50s, cool enough for a sweatshirt even though the forecast for the coming day was to be in the mid 90s. For vineyards on the valley floor this is the perfect temperature for the pick. While the majority of California’s wine grapes are picked by machine, over 90 percent of Napa Valley grapes are hand harvested and the vast majority of those are picked before first light. Though decidedly more labor intensive, this “bespoke” hand-picking process ensures higher quality for the wines as the process invariably produces kinder, gentler clusters. And the low temperatures at night keeps grapes cooler, consistently in the 60s, when they are harvested and transported to the wineries. This means there is far less chance of spikes in temperatures and sugar levels in the harvested grapes that could initiate fermentation. And nighttime picks allow those doing the labor to avoid the midday heat. When I walked into the vineyard with Kevin Morrisey, Ehlers winemaker and general manager, Vega’s crew had already been working for hours in unison, clearing the vines of their magnificent deep purple grape clusters. With methodical precision, the eight-man team moved with alacrity down the rows, cutting the clusters from the vines with sharply curved knives in rapid-fire motion so that they dropped cleanly into the plastic bins at their feet. The men, paired in groups of two, worked on alternate rows of vines as a tractor moved down the middle between them. There was lots of good-natured chatter and occasional song as they moved with incredible speed down the vines. Once each bin was filled with 35 to 50 pounds of grape clusters, the men lifted them high on their shoulders and dumped them into a trailer that followed the tractor. As the first group made their deposit, the second group of two scurried ahead and began to cut more clusters. It was clear that there was order and strategy to the process. Kevin encouraged me to take a set of clippers, don some gloves and get in the game. But I felt like a scrub playing with a professional team. I headed far down a row of vines, thinking I would get out in front of the oncoming train of pickers. But, as I stumbled and fumbled to cut the clusters on the vines cleanly, the men not only caught up with me, they laughed as they passed me by, leaving a few vines for me to clean as a token. It was slightly humiliating to be such an amateur. This crew works together regularly and all knew each other as a part of Vega’s crew for many years. Francisco had come from Michoacán in Mexico to Calistoga when he was just 16 years old. In 2001, he came to Ehlers and now is in charge of a crew also largely from his home region. I couldn’t shake the analogy that he was the Bill Belichick or Steve Kerr of this team. I picked for less than an hour and harvested maybe 100 pounds of the more than 4 tons that would be culled that morning. But I felt it. I felt the pain in my hands from the repetitive motion of cutting the grapes, the tightness in my legs and back from the bending beneath the vines, the weariness in my arms from the lifting of the bins. Imagine, I thought, doing this work for hours on end, night after night for weeks during the harvest. 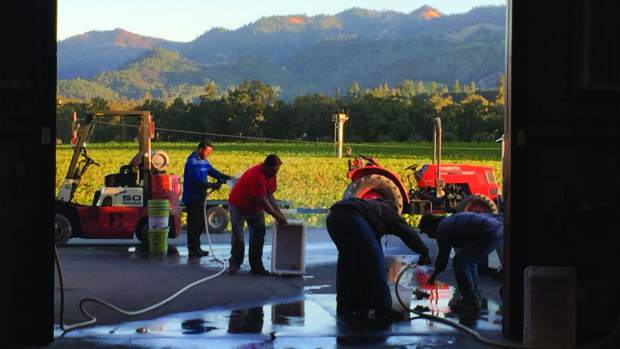 But, if not for these men who toil in the vineyards, we would not be enjoying the hand-crafted Napa cabernet, merlot or chardonnay that pair so well with our holiday repast. A nod of appreciation, please, for those who make it possible. They are noble men indeed.